Many fans were confused after learning about Sony's direct involvement in Shenmue 3, but it's simpler than you may think. Sony blew away the media and fans alike during their 2015 E3 showcase, especially when they brought developer Yu Suzuki on stage for the announcement that a Kickstarter had been created to bring fans the long anticipated title Shenmue 3. Recently, it was revealed that Sony will be a partner in creating Shenmue 3, although there is no mention of this partnership on the Kickstarter page. Additionally, during the announcement at E3, VP of publisher & developer relations at PlayStation Adam Boyes appeared to say the opposite. "Recently a developer told us that they were bringing back a fan favorite to Kickstarter for PC and PS4. Now, this is very much their project, but we wanted to celebrate their announcement on our stage. Since this has been a game that Playstation fans have been very, very, very vocal about." However, during the Playstation E3 Experience livecast, Playstation's Director of third party production and developer relations Gio Corsi made Sony's involvement clear. "We said the only way this is going to happen is if the fans speak up, and we thought Kickstarter was the perfect place to do this." "Sony and Playstation is very much a partner in this game and it's going to be run through third party production, and we're going to help YS Net get the game done," Corsi continued. "And we're going to be partners on it the whole way." While many seemed concerned over this omission, it appears that Sony's role is not as hands-on as people are assuming. Engadget spoke with Sony Worldwide Studios head Shuhei Yoshida, who explained a bit further Sony's involvement. "It's a very exciting project and there are lots of PlayStation fans asking for it. But it's a Sega IP and of course Suzuki Yu-san is the creator. So somehow Suzuki-san was able to work out with Sega to allow them to Kickstart the project. And because we liked the project, our third-party relations team struck a deal to help Kickstart the campaign at the E3 conference. That's great PR." Adam Boyes later stated "we're backing it as well... we're putting scratch in" but that the title will be self-published with Sony helping with the marketing. Had Sony made the decision to fully fund Shenmue 3, Boyes estimates that two years would have been dedicated solely to showing there is a demand for the game, then the process to secure funding would begin, then development would start. Also, in the case of full funding, Shenmue 3 would have been a first party title for Sony, which likely would have waded into murky water as far as licensing from Sega was concerned, as well as with Yu Suzuki's role in the development process. Yu Suzuki hosted an AMA on Reddit Friday, and while he did not address any of the questions regarding his partnership with Sony (many questions went unanswered due to the popularity of the thread, not just ones regarding Sony), he did say "I will say this: if we reach the $5 mil mark, one of the things I really want to do with Shenmue 3 will become a reality. At $10 million, it will truly have the features of an open world." Shibuya Productions President & CEO Cedric Biscay, Co-Producer for Shenmue 3, addressed Sony's involvement briefly in several tweets, including one that stated "Sony is providing various supports, including marketing and investment, to YSNet. However, SONY is just one of many backers of #Shenmue3." Further clarifying, Biscay wrote "SONY will not get any money from the KS, they will help to finance the PS4 version and will also help for advertisement." In 2011, Suzuki told Destructoid that Shenmue, released in 1999, cost $47 million to make. At the time of this posting, Shenmue 3 is the seventh most funded game Kickstarter of all time with nearly $3.5 million pledged and 26 days remaining. 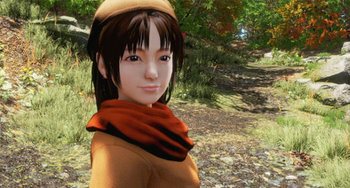 1.The E3 reveal of Shenmue 3 begins at 46:40 of this video. 2.The Shenmue 3 interview begins at 2:44:06 on this video, with Corsi discussing Playstation's involvement at 2:49:28.